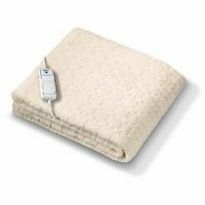 This fantastic Washable Fleece Heated Underblanket is a fantastic way of ensuring you have warm and cosy nights. 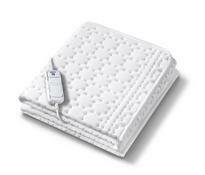 It is machine washable and tumble dry safe to ensure your blanket remains clean and fresh. It is also incredibly economic to run by costing as little as 2p per night. The fleece heated underblanket offers 4 heat levels enabling you to select your preferred heat selection and ultra thin wires to ensure a comfortable nights rest. The extra foot warmth provides you with extra heat at the foot of the bed to keep your toes toasty in a cold winters night. Safeguard protection: will automatically shut off the power if it reaches a temperature that is higher than considered comfortable, It will also shut off if an unsafe situation should arise. 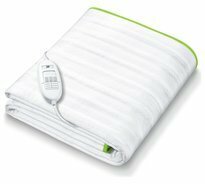 Best electric blanket I have had. Cannot feel wires, soft, toasty warm and does not ruck up. Does this blanket fit around the mattress? I cannot see this from the picture and I require a blanket that does slide about the bed! I can confirm that this item fits on the mattress via Tie Cords. What is the difference between the Duel Double and the Double>Is it that the Duel comes with two control devices and the double one. Is that the difference. Yes I would confirm the Duel Double comes with two controls and the Double with one. is the double duel controlled? I would confirm we have two doubles available. The ‘Double’ only comes with a single control and the ‘Duel Double’ comes with two.